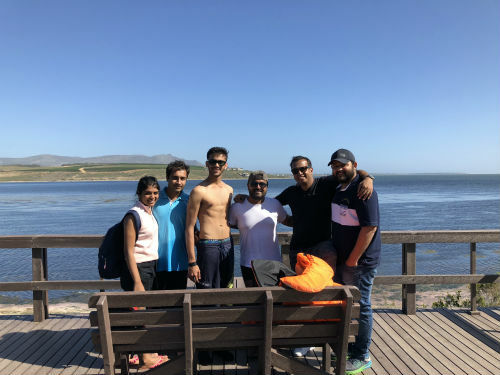 Mumbai: The Prahlad Kakar School of Branding and Entrepreneurship organized several adventure activities for its students in South Africa. Some of the pursuits – rendezvous with sharks, reptiles and sky diving tested the courage of the most brave hearted and emphasized that #BeyondFear is the path to success. The school, which aims at delivering professionals who are equipped with classroom education and adequate real-life experiences, has always shared knowledge through unique and innovative ways. These activities which are a part of its inimitable character building programme cirriculum manifests that exposure to fear is a pivotal part of learning to take risks. The legendary great white shark, revered and considerd as one of the most fearsome predators, tested the students perseverence and determination to face challenges, which are often inherent in the life of an enrepruneur. The participants were put in a safe and controlled environment with sharks to overcome their basic illogical fear of these creatures. The task aimed for the mind to fully open up to the possibilities of great strength and instinct for survival under any circumstances. Fear of the snakes is one of the most common phobias that people suffer from. Many of the fears people have towards snakes are based on myths and misconceptions. It is the human nature which makes us fear that we do not understand. But the ability to seek understanding is what makes us different. The idea of hosting the session is to break the barriers and stereotypes, learn to replace negative associations with positive belief and overcome fear. The students embraced the opportunity to further assess their winning spirit by participating in sky diving activity. The objective of conducting this programme was to ensure that the budding entrepreneurs face the rush of risk which is almost equivalent to running one’s own business. The students faced their innermost fear with conviction and credence. The activities scheduled between 21st Feb, 2018 to 28th Feb, 2018 commenced at the popular city of Cape town and Hermanus. The students were exposed to various additional feats like canoeing, zip lining, quad biking, hike up the table mountain top and bungee jumping. Earlier, this school has honed the skills of budding entrepreneurs with mountaineering camp exploring the picturesque route Darjeeling, Dhotray, Tumling, Kalapokhari, Sandakphu and Sri Kohla. These programmes aimed to enable the participants to return home as a stronger and a more resilient individual. The students were able to discover increased self-confidence, improved leadership and a desire to make a difference. The learning was so deeply ingrained in the students that henceforth they will never take the path of compromise and emerge as winners!